A majority of runners were happy that the outsole of the Brooks PureGrit 6 protected their foot from rocks and other objects on the trail. Most testers said that they were glad to feel that the shoe is slightly lighter compared to its predecessor. The shoe had adequate cushioning, based on a few reviews. A lot of users observed that the transition the shoe provides was extremely smooth. A number of users wrote that the shoe is sufficiently comfortable. The close-to-the-ground feel of this new version was a welcomed update, according to several reviews. Most runners said that the PureGrit 6 did not fit true to size. This caused them to swap the pair they just ordered with new ones that were a half size larger. One tester reminded everyone that the midsole on the PureGrit 6 is not soft at all. Another runner said that the design of the sole created an underfoot pressure point, which caused slight discomfort. With its light nature and neutral arch support, the Brooks PureGrit 6 is a trail running shoe that aims to give runners a nimbler experience during off-road runs, without having to worry about the technicality of the terrain. This moderately-priced option is ideal those seeking a shoe with reliable protection and traction while blazing the trail. There are many low-profile, go fast trail running shoes on the market. Every brand makes one. Versatile low profile trail running shoes, that can act as daily trainers or trail speedsters are much rarer. Brooks intended, I thoroughly enjoyed running in them. The PureGrit 6 has a completely revamped upper. This year, Brooks used a soft knit-like upper with 3D printed rubber overlays that improve durability. This knit-like material is very breathable. I never developed any blister or hot spots while wearing this shoe. Almost every Brooks shoe has a substantial heel cup. The PureGrit has the usual plastic heel cup, but it also has a Biomogo DNA midsole piece that reinforces the heel cup. The PureGrit also has a plush cushioned heel collar made of a moisture-wicking synthetic material. The PureGrit 6 has a very secure fit. The shoe has a narrow platform. On top of that, the PureGrit 6 utilizes a bootie construction to provide an even more comfortable and secure fit. The tongue is made of a soft and stretchy synthetic material that is adequately padded. I don’t develop any pressure points on the top of my foot even when the laces are tied really tight. The laces travel less far up the foot than standard laces, however, this did not impact the fit. The toe box is narrow but straight and nonobstructive. The PureGrit 6 is a mud-ready shoe. There is an impermeable mud-guard that spans around the perimeter of the shoe just above the midsole. There is no mudguard on the medial side of the midfoot, however, there is more midsole material built up under the arch, which makes the mudguard unnecessary there. The rubber overlays around the shoe also add some mud protection. The mudguard acts as a low-profile toe bumper to protect your toes from rocks. This toe bumper was not very protective, however, I have plenty of space in front of my toes, which makes toe bumpers less necessary. Rocks will bend the front of the shoe forward but they will not hurt my foot. Underneath the thick insole, is a layer of Brooks’ BIomogo DNA midsole material, a ballistic rock shield, and the rubber outsole. The Biomogo DNA is an adaptive cushioning system that adapts to your specific foot strike every time you land, to give you a superior ride. DNA is made of a non-Newtonian compound, which means that it changes its state of matter when different amounts of pressure applied to it. When you are running faster, you apply more pressure to the midsole. The extra pressure causes the shoe to become more firm and responsive. When you are lightly jogging, you apply less pressure to the midsole. This causes the midsole to be softer and less responsive: perfect for jogging. These adaptations happen every time your foot touches the ground. The BioMoGo part of BioMoGo DNA means that in an anaerobic landfill, the midsole will decompose within 20 years, compared to the thousands of years that it takes other midsole materials to decompose. You don’t need to worry about the midsole breaking down prematurely because you don’t live in an anaerobic landfill (hopefully)! The BioMoGo technology is not patented because Brooks wants other companies to be more environmentally-friendly. The PureGrit’s midsole has surprisingly good cushioning for its low profile design. 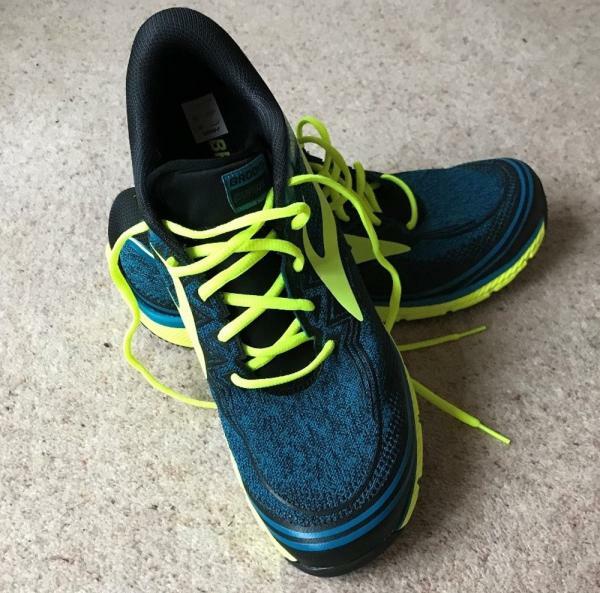 I am comfortable running up to a marathon in this shoe, however, I start to prefer other trail running shoes such as the Brooks Caldera for training runs longer than 2 hours. The PureGrit 6 is a shoe for midfoot and forefoot strikers. The shoe has very few stability features. Brooks uses its rounded heel technology so that your body is better aligned, but I think that this is a little bit pointless because the Pure Grit 6 is not a shoe for heel strikers. Underneath the Biomogo DNA midsole is a ballistic rock shield. On the trails, the thick rubber outsole, paired with the ballistic rock shield give me great protection from rocks and roots despite the minimal midsole. The entire outsole of the shoe is covered in a thick, undulating, layer of sticky rubber. Protruding from this layer of rubber are 106 hexagonal lugs, which provide great. The secure fit of the shoe paired with the lugs allow me to aggressively fly around corners during races. On top of each lug are several ‘micro lugs’ that increase surface area and therefore provide extra traction. The sticky rubber is not the most durable rubber material on the market, however, there is so much rubber on the bottom that I am not concerned about the durability of the shoe. The micro lugs wear down very quickly, especially while running on the road. The rear of the outsole is made of a thick piece of rubber with horizontal grooves cut into it. The grooves face towards the forefoot so that they grip mud while running downhill. The shoe also has this design in the forefoot, except in reverse, so that you can really dig in while climbing. These slits fill up with dirt and do not easily shed the dirt because the heel and forefoot of the shoe do not flex much at any point during the gait cycle. The PureGrit works best as a trail running daily trainer for forefoot strikers looking for a more minimal shoe. It is flexible, has a comfortable upper and is pretty durable just like a daily trainer. The PureGrit has the ability to go fast, although it doesn’t beg to go fast like the Mazama. It can handle pretty much all trails. The Puregrit 6 does not drain particularly quickly, which does not the best shoe for runs in deep slop or a run which crosses many rivers. The outsole of the PureGrit is soft enough and has enough lugs so that I can comfortably run on roads. The outsole wears down quickly when I run on roads so I only run on roads with this shoe when I am running to a trail. -0.5 indicates that you should buy 0.5 sizes smaller in a different shoe; +0.5 indicates that you should buy 0.5 sizes larger in a different shoe; = indicates that you should but the same size in both shoes. The Mazama is a much faster shoe than the Pure Grit. It has firmer cushioning and a stiffer, faster ride. The Mazama is half of an ounce lighter than the PureGrit and has 2 millimeters more drop. Buy the Mazama if you want to go fast; Buy the Pure Grit if you want an all-around lightweight trail running shoe. The Helios SR is a very lightweight trail running shoe. It weighs 1.5 ounces less and has 2 millimeters less drop than the PureGrit. The Helios has softer cushioning than the PureGrit 6. Both shoes have equal amounts of traction. The Helios has a more secure, race-like fit. The Pure grit has much more protection and is more durable than the Helios. The Superior is another all around trail running shoes for runners looking for a more minimal ride. The Superior has a similar cushion in the forefoot, however, the Superior is zero drop which, means that it has much less cushion in the heel. Both shoes have similar amounts of protection. The PureGrit is more durable than the Superior. The Superior has a much wider fit, especially in the toebox. The Speed Instinct has a lot of soft cushioning in the heel, and less, firm cushioning in the forefoot. This makes the Speed Instinct good for comfortable heel striking downhill without losing speed while climbing. The PureGrit is a more minimal, more flexible and more comfortable. Both shoes weigh about the same amount and have about the same amount of heel drop. The Peregrine has about the same amount of responsive cushioning as the PureGrit. The Peregrine is a tank. It has a much more protective upper and super aggressive deep lugs. Both shoes weigh about the same amount and have the same amount of drop. The Pure grit is more flexible and has a more comfortable upper. The PureGrit 6 completely exceeded my expectation considering the history of this shoe. My only real problem with the PureGrit 6 its weight. Although the weight has decreased from previous models, the PureGrit 6 still weighs 9.6 ounces, which is a little bit heavy for such a low-profile trail runner. I also would prefer a softer ride, however, I cannot take off too many points for that because it is just my personal preference. Overall, the Brooks PureGrit 6 meets all the criteria for a trail running shoe. It is comfortable and secure, durable, shock absorbent, protective, stable and provides good traction. How much grit does the Brooks PureGrit 6 has? minimalist running shoes so as I waited for them to arrive I was curious about how I would get on with them. First impressions were good. The blue and yellow colors are bold and bright which is just how I like my running shoes. They felt light, flexible and ready to spring me off to the nearest trail. The design here is lightweight and almost minimalist. The PureGrits have some padding in the insole compared to something like a VivoBarefoot but the reduced drop is noticeable and they feel flatter than anything I have tried so far. There is a soft mesh upper which feels as though it would drain well though I have not tried this yet. I really like the blue and color scheme as I like my shoes to be bright and bold. There are other colors available if you do not want to stand out as much but they would not be my first choice. The tongue does not come as high up the foot compared to most other shoes but I could still get a secure fit through the laces so that my feet were held firmly in place whilst running. The tongue and collar have fairly light padding but were comfortable enough and did not dig in or rub. You can tell that there is not much padding enough and can feel the ground beneath you as you run over trails but they did feel a bit firm on roads. I am more of a heel striker than a forefoot striker so they may not be the best shoes for me. However, as long as I only had a short distance to run to reach the trails they were fine. I also wouldn’t run too far on the road on them because I think the sole tread would wear out quite quickly. The grip is great and the low heel to toe drop allows for quick direction changes and all the stability you could want. There are plenty of downhill trails where I run and the grip gave me the confidence to blast down without worrying about slipping. The only time I nearly came on stuck was on a piece of wet rock but I can’t imagine that not happening with many shoes. In all the PureGrits felt fast, light and secure and perfect for shorter trail runs. Underneath you get lots of hexagonal studs spread across the sole. The tread pattern is the same throughout the sole and did not collect too much debris. I have yet to test them in deep mud but so far they do not feel like they are picking up half the trail as I run which does happen with some shoes I have run in. There is not much of a sole plate so you can feel sharp rocks underneath but it also means the PureGrits are very flexible. I doubt there would be enough grip for deep, wet mud (back to the Mudclaws for winter) but for spring, summer and autumn they will give me plenty of confidence to charge up and down trails. For me, the PureGrits are best suited to fast, short runs over a variety of trails. They feel fast due to their low weight and the small heel drop and great grip allow for quick changes of direction and lots of feedback from the ground beneath you. They don’t hold your feet in place as tightly as some shoes but if you are careful with the lacing this should not be a problem. The PureGrits are not by any means a multipurpose shoe suitable for all types of runs. For me, they are perfect for 5k races over soft but not too muddy trails. They are light, fast and grippy and really flexible compared to most other shoes. There is not much cushioning so you will feel it if the surface is too firm but this is compensated by always feeling connected to the trail more than in any other shoes I have tried. If you are looking for a short distance trail racing shoe and especially if you are a forefoot striker I think you will enjoy the PureGrits. Thank you to the kind people from Brooks for sending me the PureGrit 6 to test. The first thought I had when I purchased my pair of Brooks PureGrit 6 was that it was a pity that I hadn’t managed to get them before my holidays, where I did trails and hiking. Putting on these shoes for the first time, people with wide feet may feel they are a bit narrow. Nonetheless, as soon as you walk/run in them for a few hours and break them in, you will realize that there is enough room for your toes. These shoes have a very low drop (4 mm) and if you are transitioning from another shoe with a higher drop, you will notice this. The stride is much more natural, and you have the feeling of having no drop. Indeed, with your weight on the drop, the likelihood is that it will decrease to close to zero. A word of warning for people who are used to wearing higher drop shoes: when you switch to a shoe with such a low drop, you may have a more forceful (damaging) heel strike. Also, consider that the stack under your heels is lower than in a lot of other shoes. So, take some time to transition if you are coming from a maximalist shoe, while if you are a fan and user of minimalist shoes, you should be fine. Also, one thing to mention is that they are really light, only 258g for a UK 7 (EU 41). I found the Puregrit 6 to provide very good grip. When you are on grassy terrain, they perform well. In fact, they perform well even on damp grass, which is useful if you are an early morning runner, or live in a region that tends to be rainy. However, the zone of the malleus is very low, meaning that if you walk/run on damp grass, your socks get wet, and most annoyingly, and a potential real disadvantage of these shoes, stones get into your footwear. Finally, it is important to note that these shoes have clearly been designed for terrain and trails, not for the road. There are two key reasons I would not recommend using these shoes on the road. First, the outer sole is not suitable for road running due to the presence of small studs. Second, the lack of cushioning makes running on the road uncomfortable. Other shoes offer more cushioning. I recommend road running shoes. The PureGrit 6 can handle just about anything for short periods of time, but when the going gets tough, I usually look for more cushion and protection than the PureGrit 6 offers. The men’s version of the PureGrit 5 was about 9.8 ounces or 278 grams in weight. Now, the 6th version of the Brooks PureGrit is only around 9.6 ounces or 272.2 grams. The slight decrease in weight may not be substantial, but it does allow the runner to move more agilely through the trail without feeling the restriction of a shoe that’s on the heavier side. To provide a closer-to-the-ground feel, Brooks dialed down the midsole drop by 1mm. From the 5mm drop on the shoe’s predecessor, the heel-to-toe offset has been reduced to 4mm. Again, the reduction is not significant, but this slight modification reduces the risk of injury while evenly distributing the force received by the foot during striking. The part of this Brooks trail running shoe that has received a major update is the upper. From initial inspection, the upper’s design has been modernized. This new version has a more linear looking mudguard with a dotted pattern overlay that runs the shoe’s length, going towards the saddle. As an accent, a 3D print of the Brooks logo was embedded on the lateral sides of the shoe. A lacing garage has also been added at the top of the tongue. It is handy when a runner wants to easily tuck the laces in. Doing this ensures that the shoelaces won’t fly around as the runner goes through the trail. 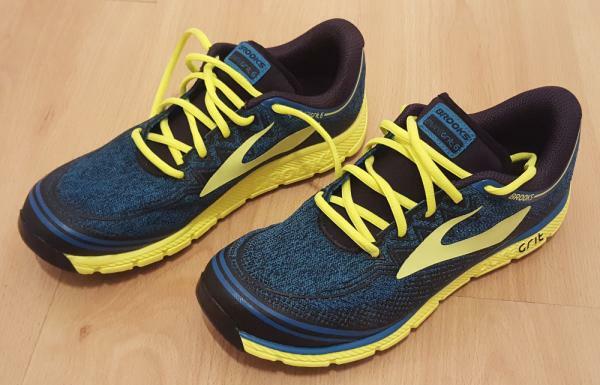 The Brooks PureGrit 6 is available in standard shoe sizes. Runners can order a pair using the standard sizing schemes for running shoes. On the other hand, the available width is medium or standard. The shoe was patterned after an anatomical last and it follows the natural curve of the foot while providing a glove-like fit. The outsole of the shoe is equipped with a durable Ballistic Rock Shield. This thermoplastic EVA sheath is not visible when looking at the shoe as it can be found between the midsole and the outsole. Its primary function is to protect the foot from being injured as the runner steps on objects on the trail that are protruding or jagged. The material used to make the outsole is called blown rubber. This type of rubber is also featured in the shoe's latest version, the PureGrit 7. The blown rubber outsole had been expanded or mixed with air during its production process. This results in a lighter, more flexible material that is placed in the forefoot section of the outsole. In the case of the PureGrit 6, the blown rubber runs the shoe’s full length, offering flexibility and an adequate amount of protection underfoot. 3D gripping lugs compose the tread. These lugs are shaped like hexagons and are evenly distributed throughout the outsole. This type of tread easily buries into the dirt and mud, preventing the runner from slipping and sliding. It works on other topographies in a similar way, as well. The Brooks Ideal Heel is also found on the outsole. To make the running transition as smooth as possible, Brooks designed the outer heel of the PureGrit 6 in a curved manner. While in motion, this design encourages runners to execute forefoot and midfoot striking. The Brooks patented BioMoGo DNA cushions the midsole of the shoe same as that with the popular trail running shoe, Cascadia 13. BioMoGo foam is biodegradable and more eco-friendly compared to other types of midsole foams. Brooks has combined this technology with another one of their patents, called DNA. Usually, the Brooks DNA is made up of a gel that adapts to the amount of force it receives, but in the case of BioMoGo DNA, the gel inserts are done away with making the cushioning friendlier to the environment, while still providing runners with a responsive and adaptable ride. Omega Flex Grooves are found on the shoe’s midsole. These indentions make way for specific structures on the midsole to move with ease. This piece of technology does this without compromising the level of cushioning the shoe offers. Focusing on the density of the midsole, Brooks has incorporated their Tuned Density Midsole technology or TDM. It is a material that corresponds to the gender and weight categories of runners. This customized denseness also offers a more modified balance for specific types of runners without the midsole feeling too stiff or too soft. The profile sock liner is made of the BioMoGo biodegradable foam. This was added to provide the shoe with some extra cushioning. Also, this insert is contoured which means that it follows the natural curve of the foot. Since it’s shaped similarly to the outline of the underfoot, it presents a more comfortable in-shoe feel. The shoe is able to deliver a glove-like fit because of the last the shoe is made from during construction. The last is a wooden or plastic mold that helps form the shape of the shoe. The particular last used in the making of the PureGrit 6 is anatomical, which means that it mimics the foot’s natural shape. On the upper, a material called air mesh can be found. Covering the entire upper, this material is highly breathable, allowing air to pass through the shoe. The environment inside the shoe is kept cool and hot spots are reduced during runs. Although the air mesh has tiny perforations that grant breathability, these tiny holes are small enough to keep trail debris from getting into the shoe. To protect the shoe from mud as well as other particles, Brooks placed a mudguard on the sides of the shoe. The material this protective structure is made of also repels water, preventing the foot from getting wet when the runner accidentally steps into puddles.